Bugatti has set up a record at this year’s “Motor Klassik Award” ceremony held by German motoring magazine Motor Klassik. The Bugatti Type 57SC Atlantic, one of the world’s most beautiful and most valuable automobiles, has been chosen by readers of Motor Klassik for the fifth time as the best car of the 1920s and 1930s. Bugatti is therefore the first brand to have won an award every time it entered and so often in one category. The award ceremony was held in the Colosseum Theater in Essen. 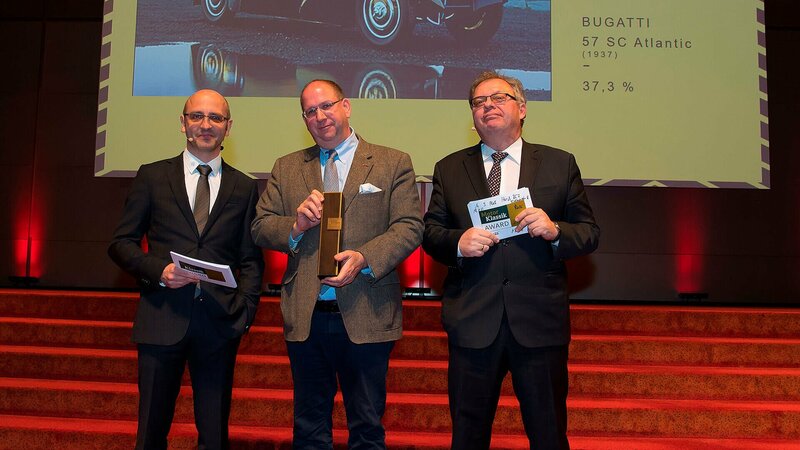 “This award for the Atlantic is a great honour for us,” said Julius Kruta, Head of Tradition at Bugatti Automobiles S.A.S., at the award ceremony. “It is great to see that people are still so thrilled by this incredibly beautiful car. We would like to thank the readers of Motor Klassik for this fantastic result.” The supercar was once again the clear winner against five competitors in its class, with 37.3 percent of the votes cast. In 1936 to 1938, only four examples of the 57SC Atlantic were built. Nowadays, only two of these cars still exist in entirely original condition. The Atlantic is the most famous variant of the Type 57. With the SC model (“SC” stands for “supercharger”), Jean Bugatti, son of company founder Ettore, wanted to offer a sports racing variant in addition to the standard version. The sports coupe was equipped with an in-line 8-cylinder engine with a displacement of 3,257 cm³ which developed about 200 PS. The vehicle could reach speeds in excess of 200 km/h. Jean Bugatti, who had already proved his talent for special body designs with the Type 41 Royale, the Type 55 Roadster and the Type 50, designed an extremely lightweight, aerodynamic body for the Atlantic. Aluminium was used for the body panels. The result was the distinctive design feature of the Atlantic, a clearly accentuated dorsal seam running from the windscreen to the rear bumper. This is a riveted joint that holds the two halves of the aluminium body together and is today a characteristic design element of the brand. The wheels stand out from the body and are accentuated by huge wings. Viewed from above, the beautiful, elegant shape of the Atlantic becomes especially clear, with the extremely long bonnet running into the round rear, forming an oval. During the annual survey held by Motor Klassik, a motoring magazine published by Motor Presse of Stuttgart, readers are asked which classic cars they especially appreciate and which modern vehicles could become coveted classics or recent classics in a few decades. There are six categories based on the year of production and six special categories.